Chief Magistrate Simone Churaman cautioned the media last Wednesday 8, not to publish information from the Glenn Jackson Preliminary Inquiry that would create a “substantial risk that the course of justice will be seriously impeded” or “where there may be interference with the due process”. At press time, the Preliminary Inquiry was in its fourth day and the prosecution had claimed that Jackson was shot by accused Francis “Prickle” Williams, at the small field in front of the Grammar School, on the night of Sunday, March 05, earlier this year. One by one police investigators testified that Williams gave them a detailed account of the circumstances surrounding Jackson’s death in a voluntary oral statement on the morning of Saturday, April 29 but William’s attorneys accused the police of fabricating this confession. The police however insisted that Jackson was shot with his own 9 mm pistol after Williams pointed it at him while they had a dispute. 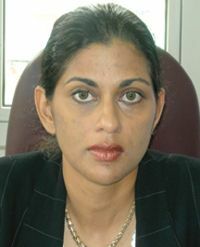 Attorneys Kay Bacchus-Browne and Grant Connell are appearing for the defense while the case is being prosecuted by Gilbert Peterson SC, of Trinidad and Tobago, and Saboto Caesar of the office of the Director of Public Prosecution of St Vincent and the Grenadines.